Happy New Year! Happy New Year! Happy New Year!!!! May 2016 bring us peace on Earth, abundance of wealth so we can give a helping hand to the needy eradicate poverty. May 2016 put back smiles on every children that see have seen the worst... the damaged and harm that we have done to humankind. The one thing I am looking forward to Ozzie summer ... is the Mangoes. ... there are voices (real voices) could be heard muttering in every mango that I peeled, sliced and popped into my mouth!!! "Yeah mom, thats what you said every year.... ;p"
It was my third post, back in Feb 2009... where we had a 'competition' for the best dressed mango glutinous rice dessert. Click on the photo will take you back to my 'Point and Shoot' days. And this post reminds me of my 'mother-daughter' trip to Bangkok 2 years ago. We had fun (I know my daughter did). We visited every Shopping malls... we loved the weather in Bangkok. Lets hope that we will have another good year ahead. May the MIGHTY ONE shower us with HIS blessings, give us good health and keep us safe from harm. Wash and soak glutinous rice overnight. Line steamer with muslin cloth. Steam glutinous rice for 30-40 minutes or until glutinous rice is cooked through. Add coconut cream, sugar and water in a heatproof jug. 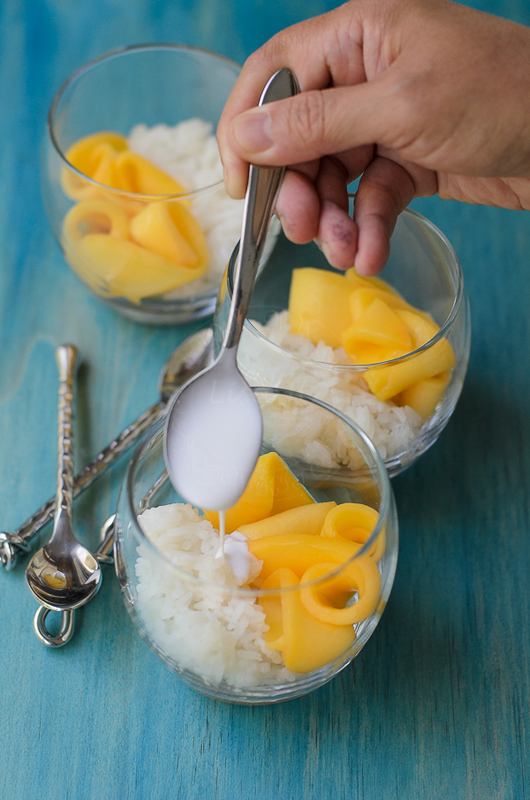 Microwave on HIGH for 10 seconds (do it twice) to warm up the coconut cream. Carefully and gently transfer the cooked glutinous rice into a heat proof container. Pour the coconut cream mixture. Cover and put it aside. The glutinous rice will absorb all the coconut cream mix. Peel and cut mango (either slice or cut into bite-size chunk). Stir 1 tablespoon of sugar into 100ml coconut cream. Divide glutinous rice into 6 glass. 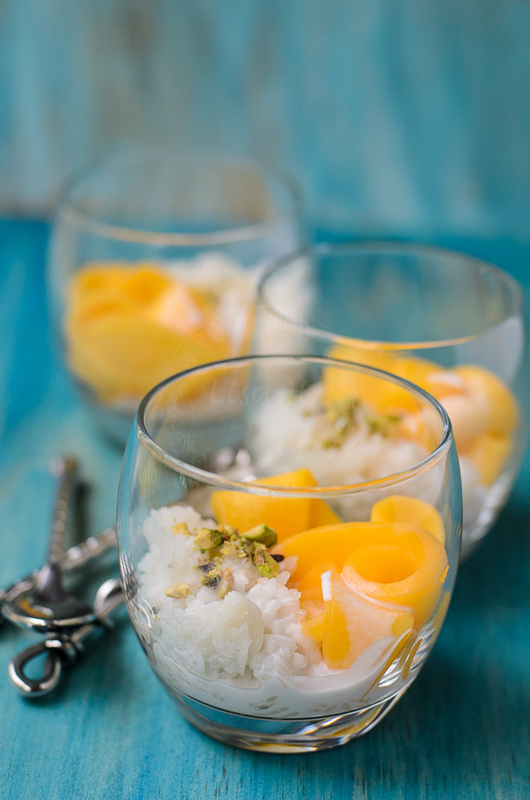 A lovely and exotic dessert! This is one of my favourite treats and I love how you have served them! My husband loves rice pudding. I believe he would love this! Mango and cherries sound so good right now! 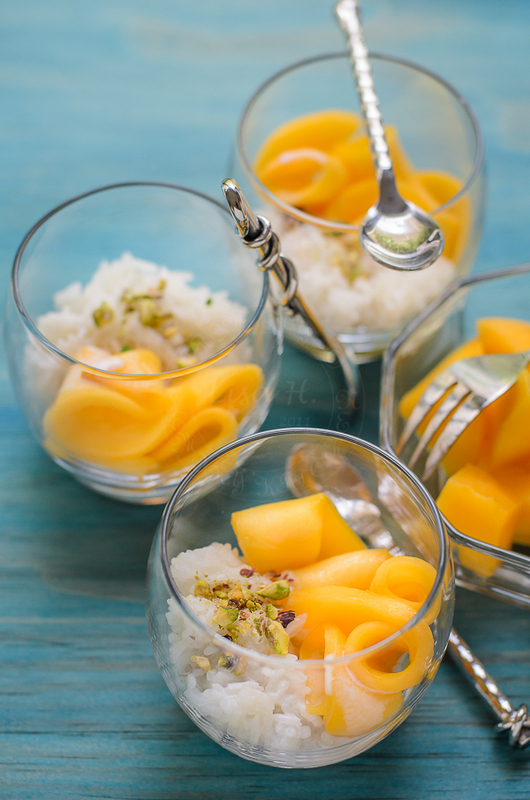 I love tropical fruits and like you, mango is at the top of my list for Summer fruits. Aren't they super delicious? I bet they taste even better with this glutinous rice. YUM! These desserts are so cute!! Love the idea! Can't wait to try it!